Yesterday I finally completed my visa that I needed so that I will be able to work in India. I decided to leave it as long as possible since people going to work in India for Infosys were having problems obtaining the right version of the visa. The Indian Embassy has to be partly to blame due to an unstructured system and paper work needed. And this unstructured way was apparent when they wanted to look at my contracted and required all 10 pages of the contract instead of the front page that everyone else who obtained the visa for working in India had presented. Of course, I didn't wanted to give the original contract so I had to go out and get the 10 page contracted photo copied, and then when I arrived back, the India Embassy had closed for lunch till 2pm. After return at 2pm, I was then told by the Indian Embassy that the doors will open at 3pm, so with more hanging around I finally got in and went straight to the queue and thankfully they accepted and told me to wait for 10-15 minutes. So I decided to go and see the other guys I went with to get my visa done, Antony and Gaurav. Antony and Gaurav had already obtained their visa, but due to Infosys not giving us the required information, had to get something changed on their visa. It must read something particular and they did not have this. They needed to wait for this guy at the embassy who signed their visa so that they can get it changed. They were waiting with me earlier on and found out that they were waiting in the wrong section... but to be honest it wasn't their fault, the Indian Embassy told everyone with visa stuff to go up stair, but they needed to be downstairs, so they wasted 3 hours queuing upstairs for no reason. Anyway, when I went to see how the guys were doing, it wasn't going to well and was still waiting for that guy. After 10 minutes I went upstairs to get my passport back with a new visa. I went to this door where you have to wait to get your passport back, and then I heard a call, "MR LEECHURT, MR LEECHURT" and I was like eh? and looked behind and saw waves waving urging me to go to the counter, so I went and there I see my passport. WOOHOO, after 5 hours waiting, I finally got it done!! WOOHOO!!! After that I went downstairs to see how the guys were doing. 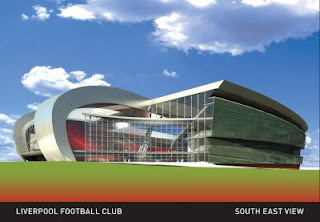 25th July 2007 at 11pm, Liverpool release photos of the new stadium that they are going to build, and it looks amazing! Just take a look at the photos below, just simple unique and so different to anything that is out there, just what Liverpool needs for its new home. 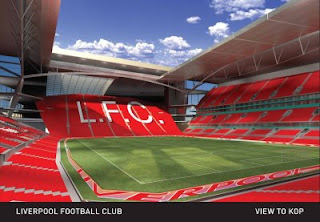 I just love the new Kop, picture 3. It looks so steep it is going to scare the living daylights out of the opposition. You will notice a lot of glass on the side of the building that you can look in, well that will be gone when Liverpool get the planning permission they need. 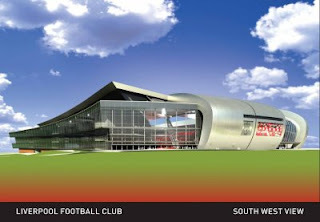 They are going to start building with 60000 seats inside the stadium, but by the time it is open in 2010, Liverpool should have got there planning permission to build just under 80000 seats. It is going to be amazing. Just need to go up to Liverpool one day to see a match, actually I should make a trip up to see a game in the old stadium. Also I revisited the game, Simcity 2000. LOL.. it is such a great game.. Love it.. hehehe, but now it is a bit boring since I found out that you can cheat. Argh, wish I didn't have to cheat.. oh well.. Anyway, that's about it, and my left arm is hurting more from typing this out. I will post the photos up on my graduation that I have taken on my website when the new site is about and running.